Dumbarton supporters are a pretty well travelled lot. Well, the ones I know are. Judging from the reports in Sons View’s regular ‘Fan of the Week’ slot, there’s a fair degree of mileage involved in being a really dedicated follower of the Mighty DFC. Ross County’s ground is one of those more often mentioned as an exception to the ‘been there, seen that’ rule, I note – but certainly not Glebe Park, home of this afternoon’s opponents, Brechin City. My own geographical distance from Dumbarton (getting on for 400 miles), and the fact that I’ve mastered neither time travel nor great wealth in my 51 years on this planet, means that I get to far fewer games in Scotland than I’d like to – and when I am here naturally the priority is a trip to the Rock, or in a previous era good old Boghead. On a rough estimate, I reckon I’ve notched up visits to about a dozen of the 40 other senior grounds north of the border, and quite a few more in England, obviously. The last time I made it to Brechin was over twenty years ago. It was a journey by coach on 17 September 1988. I can’t quite recall where that trip started out, but it took a couple of hours and my then girlfriend wasn’t too impressed to discover that we had a nice long walk to the ground from our dropping off point. But it was a holiday, and a brisk hike on a sunny day is all part of the deal, right? Well, yes. Though it helps if you get there in time for a relaxing meal and a drink beforehand. The hospitality in Brechin is fine and I have some affection for the ground, but veggie-friendly pies were not on the menu that day so we had to make do with tea and a leftover half packet of peanuts that had been festering in my pocket! The match itself ended in a 1-1 draw and I was quite satisfied. To date that season, Sons had won only one of their first six games (they lost the others), and if they had been mauled in Angus I would have been in even more trouble from my companion! The omens were not great. Bertie Auld had just been sacked as Dumbarton boss and morale was low. But a determined if not inspired performance against Brechin earned us a point, with 23-year-old striker Benny Rooney getting the goal. That season was a tough one for us in the Second Division. Dumbarton finished 12th but, crucially, stayed up. Having lost to the Hedgemen in December that year, Sons finally claimed revenge at Boghead in April 1989 with a 1-0 victory. Today we receive the players, staff and fans of Brechin to the Strathclyde Homes Stadium with a good deal more confidence than we displayed during our last outing to Glebe Park on 29 August, when a 3-1 defeat was watched by just 470 spectators. Sons’ win against Arbroath at the Rock last Saturday has finally “got the monkey off our back”, as Jim Chapman likes to put it. Indeed, with three away victories on the trot, plus the Stirlingshire Cup triumph, Dumbarton haven’t lost a match on their travels since that reversal in Angus. The aim today is to put that right and to start to make the Rock the kind of football fortress that its name and neighbouring Castle suggests it should be. This isn’t going to be easy. Brechin lie in second place in the division, with a perfect home record. However they have lost four out of six games away so far, indicating a certain brittleness in the travel department. The upshot is that both sides are vying for continuous improvement. Sons then have to get on the bus themselves for the next two games against Stenhousemuir and Cowdenbeath, the rivals we beat to the Third Division Championship last term. A couple of wins before we next face the Binos on 5 December could mean that we will find ourselves in the play-off zone rather than worrying about the drop. But such notions can be deceptive. In a division with only ten members there is barely anything called ‘mid-table respectability’. If you are not at the summit you are always either on the brink or on the ledge, so it’s best to focus on the immediate challenges than to speculate about where they might leave you. One thing is certain: points and goals all tally up and push us in the right direction. Exeter City and Brentford both come to this afternoon’s match needing a good result to help take them out of the lower reaches of the League One table. If last season’s encounters are anything to go by, supporters of the two sides can expect a competitive and absorbing game. While the Grecians were securing a last gasp draw at St James Park to basement team Wycombe Wanderers on Saturday, the Bees were claiming a 2-0 home victory over Stockport County (who have exactly the same number of points and precisely the same goal difference as City) thanks to goals from Charlie MacDonald and Myles Weston. Brentford’s two previous outings have resulted in a defeat at Leyton Orient and a goalless draw hosting Hartlepool. The upshot is that the two sides are now separated by just four places, three points and seven goals. This division continues to be very tight indeed. At the end of this season, I remain pretty confident that both teams will be safe. They have good players and a positive attitude, though their respective qualities are being tested robustly by football in a higher division. So there’s much hard work to do before either can breathe easily. Neither the Grecians nor the Bees could be described as ‘fashionable clubs’ these days, but both have had their curious brushes with fame and celebrity. Exeter fans will probably look back rather ruefully on that extraordinary day when a certain illusionist produced now departed music superstar Michael Jackson to parade around the pitch. But whether you blinked or not, it happened. Similarly, Brentford supporters will have been puzzled when it was rumoured that they had come to the attention of a number of Hollywood stars a few years ago. I’m not sure that they can match ‘the King of Pop’, but for a number of years rock keyboard legend Rick Wakeman was known to be a keen Brentford follower. I happen to know that there’s even a dedication to the Bees on the inside cover of the 1977 Yes album ‘Going for the One’ – an obscure fact which might come in useful for pub quiz question hunters, if nothing else! These days Rick’s affections seem to have migrated to Manchester City, following a mysterious falling out with his old Brentford pals. Fandom can be as movable a feast as marriage in the celeb world, but the constancy of the bedrock support at both Griffin Park and St James’ is something that will undoubtedly weather both time and fashion. When the fixtures for this season were announced, this was one I marked with a big red pen in my diary. As a child I lived a decent stone’s throw away from Brentford, and my late paternal grandfather was a long-term supporter. 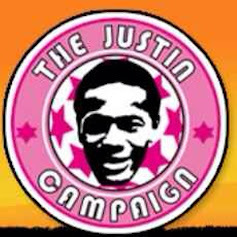 Indeed it was a trip to Griffin Park with him at the age of nine that really confirmed me in my love of all things football. That said, the schedule has not been kind to me as far as Grecians versus Bees tussles are concerned. I missed both matches last season, and this week pressing work and domestic commitments mean that I will be on my way from London to Birmingham as you settle into your seat or take your place on the Big Bank. Would I have had divided loyalties? Not really. I want Exeter to grab those points, though I wish both clubs well overall and find myself keeping my grandfather’s memory alive through a watchful eye on what the Bees are up to. Similarly, I found time a few weeks ago to go and watch my namesakes Barrow in action away against Crawley Town in Exeter’s old stomping ground, the Conference. They snatched a 1-0 win, haven’t lost since, and are making an impressive fist of securing their place in the Blue Square Premier for a second season. The year the Grecians won promotion back to the League I made the away trip to Broadfield Stadium on a freezing midweek evening to watch a 2-2 draw along with 841 other people who had decided to abandon the Champions League on the telly in order to experience ‘real football’. There certainly weren’t many celebrity fans to the inch in Crawley that evening, and after Exeter’s triumph in the Wembley play-off final I never particularly imagined myself heading back to Broadfield again. But then I found myself less than an hour away with a chance to catch the Bluebirds, and couldn’t resist. That’s football for you. Quite apart from the loyalties we develop, there’s a breadth, passion and interest to the game that makes for unexpected treasures. You never quite know when something special is going to happen. Let’s hope it’s today. So Liverpool managed to win 2-0 in spite of my backing. And a gritty game it was, too. Mind you, at the beginning of the second half I commented to some fellow pub watchers that if I'd wagered on this one it would have been for a nil-nil draw. As Fernando Torres struck, magnificently, I thought to myself: "That's why I don't bet!" The pre-match festivities saw the Anfield pitch festooned with balloons and beach balls -- from the Kop end. Manchester United fans had threatened to bring the offending items to celebrate Sunderland's extraordinary goal-that-shouldn't-have been last week. But Liverpool said they'd search away supporters before they entered the ground. So instead they satisfied themselves with Eric Cantona masks to settle a much bigger score. Weird old game, football. As well as taking three points this afternoon, Liverpool have now struck lucky in selling out those £10 'beach sets' from the club shop. Just when the winter is about to set in. I think it's called 'having the last laugh'. Right, I'm off to watch Ken Loach's 'Looking for Eric' on DVD, while my friend Kevin Scully texts me from West Ham, who were pulling back from an early pasting from stylish Arsenal last I heard. Then it's back to some work. I've been gently chided by Kenny Macaulay, Dumbarton's inimitably colourful (Partick Thistle supporting!) 'Piscie priest for not heralding Sons' glorious first home win at the Rock yesterday yet. Don't worry, Kenny, a full update will follow. And a bit about Gambia, too. See you in the First Division next season, eh? I'll be backing Liverpool over Manchester United in the much-touted 'battle of the Reds' this afternoon -- though as a young kid, like many others, I had my flirtation with post Busby-babes United... not least on account of my boyhood football hero, Denis Law. It's hardly an insight to note that the game has changed out of all recognition since then, and what was once a clash of sporting titans is now as much a confrontation between corporate giants, their brands and their ridiculously paid on-field representatives. Without wishing to be backward looking or overly sentimental, this is a great pity. Money has both regenerated and compromised the modern game beyond all calculation. But I confess that it is sheer romance that keeps me on the side of Liverpool: the spirit of Shankly, the Merseybeat, Hillsborough, 'You'll Never Walk Alone', and so on. Plus several good people I know have them as their EPL team, including friends at Dumbarton - who happily stole my heart from MUFC back in '69. Today is in certain respects a trial of Liverpool boss Rafa Benitez, too. If there are question marks against him, many of them reside in his questionable purchasing decisions under the £10 million mark (an observation that is bound to make us 'lower league' fans laugh out loud!) Rafa's a private, somewhat distant man, and is subject to the occasional fits of pique and arrogance that seem to go with the ego territory needed to sustain a club at the more stratospheric levels of football. But he also appears to have genuinely imbibed 'the Liverpool spirit' and he has rebuffed various financially loaded attempts to lure him to Spain. Loyalty of any kind is a rare commodity in the game these days. I hope it wins out, both ways. Meanwhile, here's Liverpool Kop offering some "critical realism" on developments on Merseyside. It’s now three games since the Sons last made a match day appearance at the Rock, and boy don’t we feel better! Three wins in a row - including lifting the Stirlingshire Cup against Stenhousemuir – has provided a tremendous boost after a very difficult start to the season. It would be foolish to say that all is now well. You can never stand still in modern football. But at last we’re heading in the right direction. After last week’s convincing 3-1 victory against Alloa Athletic (who had beaten us by the same score on 8 August), I found myself thinking further about the provenance of the number three for the Sons this season. Apart from the stats I’ve already mentioned, seven of our league matches this term have involved one or other of the teams scoring three goals. Only three haven’t. We’ve also recorded victories on each of the last three away trips. What would be good now would be three home wins in a row to rectify the displeasing ‘zero’ on that front, starting this afternoon against Arbroath – who also beat us 3-1 at Gayfield back in August, you will recall. Obviously that means we owe the Red Lichties three back, starting as soon as possible after 3pm today. By my reckoning we also have a quartet of players who are on the threshold of notching up their first three goals this season, and naturally we await the first Dumbarton hat-trick. I suppose that should have come on the third Saturday in October rather than the fourth, but you can’t have it all. Not everything about this three lark ends up going your way, you will have noticed. We’ve lost three games at home so far, for example. That said, there’s always a compensating factor. Like being only three points short of the trio of play-off places, for example – and not finding ourselves wholly fixated on the other end of the table. We are also grouped with three other teams on 11 points. Thinking in threes can start to warp your mind in other ways, too. When I was retuning the radio last week I winced as I found myself accidentally listening to a track from a less-than-stellar album called ‘The Power of Three’, put out a few years ago by a reformed version of the old prog rock trio Emerson Lake and Palmer (known to their detractors as ‘cumbersome, fake and trauma’), featuring Cozy Powell on drums. I’m not sure that it lasted three minutes before I made it to the off button! Just in case I’ve offended someone in this regard, I should mention that one of ELP’s best efforts is called… yup, ‘Trilogy’. Right, back to the action this afternoon. Our opponents from Tayside will share with Sons a desire to put further points and goals in the bank and navigate towards a more secure position in the Second Division, which is proving very tight at the moment. Apart from leaders Stirling Albion, who are five points clear, and Brechin and Cowdenbeath, who are chasing hard, the other seven teams in the league are all covered by just four points. So a couple of matches can make a big difference, as we have already seen over the past fortnight. After ten years rising up to the First Division and then sinking back to the Third (they sank to the basement in 2005 after being beaten by Dumbarton – yes, you guessed it, 3-0), the Red Lichties consolidated themselves in seventh place in the Second Division last year. They won promotion to this level the season before the Sons, while we were busily trying to avoid the wooden spoon. Arbroath now come to the Strathclyde Homes Season on the back of a 1-0 defeat to the Blue Brazil, who they beat in the first stage of the 2007-8 play-offs, as it happens. Like Dumbarton, their fragile form this season means that they have been better on the road than performing on home turf. Apart from the hard-fought 2-2 draw against the Binos on 10 October, the Lichties have endured eight defeats in their last nine outings, so they will be very keen indeed to try to reverse their poor form. It should be a strongly contested game. OK, I’ll see some of you on the third Saturday in November, when Peterhead visit us and I’m next able make a trek up to SHS from The Far Post. It’s now a fortnight since Exeter City played a league game at St James Park, and in that time – as you will hardly need reminding – we have lost two away matches by three and four goals respectively against Walsall and Huddersfield, and have exited the Johnstone’s Paint Trophy on penalties after a 1-1 home draw. Though those defeats by no means tell the whole story about how the team has played, in bald statistical terms the situation does not look good at present. The pressure is on for four points or more from today’s match against bottom side Wycombe Wanderers and from next Saturday’s Devon encounter with Brentford, who presently lie in seventeenth position – only one point and three places above the Grecians. The secret of success in a situation like this is not to let pressure translate into anxiety, but rather to use recent setbacks as a motivational spur to find the winning trail again. Easier said than done, maybe. But good coaching is about helping players into the right frame of mind, as well as ensuring that they are confident about their role, on top of the tactics, and keyed up both physically and technically. Modern football is a multi-faceted game, and in order to produce the right results, everything has to come together in those crucial 90 minutes or so between kick-off and the final whistle. Having the right blend before or afterwards isn’t sufficient. When the going is tough, waning confidence, bad luck or small mistakes are magnified for players and fans alike. Similarly an early break or goal can settle you down and set the rhythm moving once more. There’s a strange alchemy to football, and even the best can find themselves puzzled by how things turn out. Sometimes it just doesn’t seem to make sense. City boss Paul Tisdale was realistic enough to admit in the aftermath of that Huddersfield tanking that he couldn’t immediately identify what had gone wrong – though the quality of the opposition was evident. Training and preparation had been very positive, he said. It was on the field of play, the one place where you need things to gel, that so much seemed to unravel. No doubt a lot of recovery work was put in before the trip to Walsall, which makes the reversal there – in a match where a point wouldn’t have been out of the question given the performance – that much harder to stomach. But aside from identifying and learning from mistakes, there’s no point in looking back. A home game is a different proposition, and it’s worth noting that the Grecians haven’t lost a league game here at St James’ since 29 August, when two early slips against Milton Keynes Dons cost us dear, despite a good fightback and Barry Corr’s 51st minute goal. At the beginning of the season, when the unknowns of League One were that much greater, everyone was saying that home territory was likely to be where our final fortunes would be decided. This is often true for a newly promoted side. Perhaps the most dramatic example at the moment is Burnley. The Premier League minnows, guided by wily gaffer Owen Coyle (who, incidentally, started his professional football career, along with his two brothers, at my team Dumbarton) have maintained an astonishing record at Turf Moor, winning all four games, even the one against Manchester United. The corresponding loss of all five away matches still leaves them in tenth position, clinging on to the top half of the table by their fingernails. Thankfully, Exeter City’s away record and performances have been rather better than that, with four points garnered, alongside a few hammerings. I’m sure they can improve, too. But first we have an opportunity over the next week to prove ourselves at home against other clubs in the lower reaches of the division. Wycombe have yet to win away, but they recently had a boost with the appointment of former Aldershot boss Gary Waddock. His reign began with a 1-1 draw against Colchester (who we face on 14 November), after spending two and a half years with the Shots and leading them from the Blue Square Premier to sixth in League Two. The Chairboys had a poor start to their campaign under seemingly luckless former manager Peter Taylor, who ended his playing career with eight games for the Grecians in ’83-4 and later went on to suffer against City when he took over at Stevenage. The new Wycombe boss got to know Exeter well with his old charges, and will be looking to outwit us this afternoon. However Exeter quickly leap-frogged Aldershot after losing out to them in the Conference title chase two years ago, and hopefully we will be motivated give Waddock’s new boys another rough ride today. Great comedy entertainment on ITV tonight (and its not often I find myself saying that). I switched on after 20 minutes or so to witness In-ger-land being outplayed for a good quarter of an hour... by Belarus, following their scraped early goal. Meanwhile the Wembley crowd have been using a Mexican Wave just to stay awake. Can't see David Beckham being threatened by this "youthful promise". South Africa 2010? It can't go wrong! Wondering what's involved in the latest takeover at Portsmouth and all the other finance-related fantasy football moves rattling around the media - or not, when frankly they should be? As far as the English game is concerned (with one or two additional forays into other nations), the Football Management site maintained by John Beech from Coventry University is unrivalled. Hat-tip to the Sonstrust and Campbell Yule on this one. Beech is a co-director of the Centre for the International Business of Sport and a widely published author on various aspects of sports management and English football management in particular. It's worth keeping an eye on the Supporters' Direct blog too. How we need an equivalent website for Scottish football. The future of the Scottish game was subject to an interesting debate at Stirling University on 2 October 2009. More on that anon. While my locals Exeter City were unfortunately losing out on penalties to Swindon Town in the Johnstone's Paint Trophy (surely the most boringly prosaic football award name since the dire Milk Cup, which sounded like something you might have lost in the playground) I was up in London. This meant that I could catch Leyton Orient at home to Brighton and Hove Albion in the same competition, thanks to the promoting of my friend Kevin Scully. Here's a snap just before kick-off from my iPhone. It was a really entertaining little match, with some good skill on display and quite a few near misses. The Os grabbed the honours within a whisper of time-added-on, much to the chagrin of the vocal visiting support. Credit to them, by the way. I lived in Brighton myself for over five years, but Albion were one of the few neighbourhood sides I never got to follow. Knowing something of the people and environment of Falmer, I'm afraid I wasn't particularly sympathetic to the Club in the shenanigans over their ground, and found their public presumption concerning a mess they effectively got themselves into rather irritating. Good luck to them this season, nonetheless. But back to tonight. As a result of being in the capital rather than the southwest, I found myself missing yet another penalty shoot-out -- such as the one that was transpiring at St James Park in Exeter, as it happens. In 43 years of watching football I've never seen a shoot-out 'live' to this day. I was secretly hoping for a chance this evening, but in the end I was happy enough for my Orient friends to let that little unfulfilled ambition pass once more. 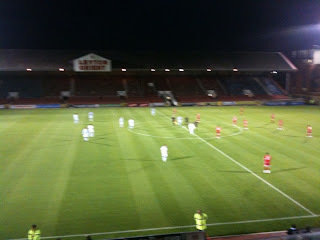 It was a great seat towards the top-centre of the new stand at the Matchroom Stadium in Brisbane Road, too. Here's the first of two very brief lo-fi phone video clips showing the Scotland squad (well, ten of them plus coaching staff) training at the Sons' splendid Strathclyde Homes Stadium beneath the Rock and Castle in Dumbarton. An ex-colleague of mine has been all over the media over the past 48 hours. When I knew Mark Perryman he was in magazine marketing and political journalism. Then he went on to co-found "the sporting outfitters of intellectual distinction" Philosophy Football, and over the years he's spent some considerable time involved with England fans' groups. In that capacity he was interviewed by the BBC over the controversial pay-per-view Internet-only streaming of England's World Cup qualifying match against Ukraine on Saturday. He's rightly described this as "a disaster and a disgrace" in terms of grassroots accessibility to the game -- especially for older people, those on low incomes and those without high-quality broadband... let alone peole who might want to watch socially, rather than crouched over a laptop. Both technologically and demographically, the prospect of the likes of 'Perform' being able to narrow-cast football for profit ahead of people is a grim one. That's true even for those of us who support another nation (in my case, Scotland). 'Perform' certainly wouldn't be getting my money, even if it was a match I wanted to see. As Mark says: "Fifa and Uefa should insist as a condition of entry [to international competitions] that all nations sell their games to terrestrial stations, whether home or away." Meanwhile, thankfully, the Republic of Ireland's titanic World Cup qualifying tussle with Italy, showing on Sky Sports 2 at 7.30pm, will at least be viewable in pubs. As for Scotland, ironically the Scottish Football Association has had to shelve plans to transmit the Kirin Challenge Cup match with Japan on the Internet due to technological difficulties. The idea was to broadcast the game in Yokohama (also on Saturday 10 October) on the official SFA website. The intention had been to provide the service free to Scottish supporters, in contrast to the deal struck by the Ukrainian FA for the England game. Well, for 90 minutes the bookies were on the way to being proved wrong, with Dumbarton looking set to nab at least a draw against SFL Division Two leaders Stirling Albion, having led twice already. But then Martin McNiff was sent off for Sons and the Binos' Scott Robertson grabbed the winner in time added on. Another point or three would have been a tremendous confidence booster after the vital Peterhead win, but it wasn't to be. I have an inkling that we can get something out of the trip to East Fife on Saturday, but missed chances and what often looks like a missing defence are the key problems that have to be addressed. That's how it looks from the far post, anyway. Meanwhile, there's a chance to lift the Stirling Cup against Stenousemuir at Ochilview on Monday 13 October. If I hadn't got a work engagement this weekend, I'd have been very tempted to head north for those two games. As it is, I'm aiming for the Blue Toon at the Rock on 21 November, and have booked for Alloa on 19 December - when I'll be match ball sponsor, celebrating my 40th anniversary as a Dumbarton supporter. I see that ex-Livingston and Hibs player Stuart Lovell is recommending punters (most notably Scottish Sun readers) to bet against the Sons today. He declares: "I like Stirling Albion away at Dumbarton this weekend. Bookies spend far less time pricing up games in the lower divisions because they can't be bothered. But Stirling Albion have won five out of seven and are playing against a team who have won one in seven and conceded more goals than anyone else. You'll get them at even money and that's good." Here's one I certainly hope doesn't go according to the book. A week is a long time in politics, declared one prime ministerial Harold. Asked what made the job of leading the country so demanding, another famously replied: “Events, dear boy. Events.” Even so, Messrs Wilson and Macmillan never had to run a football club, and for the most part they didn’t have to face a highly vocal group of supporters on a regular basis, either. Remember, theirs was the era before the circus of televised parliamentary questions and news replays. What’s the toughest job in football? On a rainy day it’s probably an even split between being a long-suffering manager and a long-suffering supporter. When you have power, the cost of responsibility is high and every decision or utterance invites unforgiving scrutiny. When you watch from the stands, every downturn feels like a kick in the guts and the multiplicity of solutions on offer all look deceptively clear. For both parties the tide of fortune can shift radically from one Saturday to the next. A week ago, Dumbarton defied mounting despair at the Rock with a gutsy performance and a vital last minute 2-1 win away to full-strength Peterhead, who were benefiting from the momentum of a victory on the road at Arbroath. It was a tremendous achievement for the Sons. Just the fillip Jim Chapman, the players and the fans had been willing. So the course of events has swung Sons’ way again. But hold on. We now face league leaders Stirling Albion. The pundits would give us credit for a point. But it’s three that the team and the boss will be aiming at, to banish a torrid start to the season and chart us towards Second Division safety, at least. When Jim responded to what he saw as negativity creeping into the club in the wake of a grim pre-season and a disappointing opening to the new campaign, not everyone was happy. Personally, I like managers who speak their mind, and who also listen. After all, we supporters are pretty vocal. But if it’s going to be a useful conversation, there has to be some hearing at our end, too. Some years ago I heard similar sentiments from one Brian Clough – but with a bluntness that makes the rhetoric of the modern game look more like, well, ‘management speak’! Wearing his heart (and mouth) on his sleeve was one of Cloughie’s characteristic traits, earning him respect and opprobrium in equal proportions. Back in 1989, when I was a journalist on a small labour movement newspaper, I foolishly spurned the opportunity to interview Old Big 'Ead. I don’t know what possessed me. Still, I dutifully fixed up an agency photographer to accompany our young reporter – who had sensibly seen the gap and darted in to score! The camera wielder in question liked to sport a spiky hairdo and ponytail. Needless to say, Mr Clough was not impressed, and the poor boy returned with a flea in his ear as well as a picture or two. As a distraction from Dumbarton’s woes, I recently forked out for the DVD of ‘The Damned United’. It brought this minor incident – and the many more serious trials of football – back to mind. The film is a much warmer (and fairer) portrait of Clough than David Peace’s dark, psychological novel. Tom Hooper’s movie captures a man whose complexity issued in a surprisingly straightforward and idealistic approach to the game, and whose flawed ingenuity could veer between angular wisdom and breathtaking foolishness in considerably less than a week – especially without the more prosaic accompanying skills of Peter Taylor. 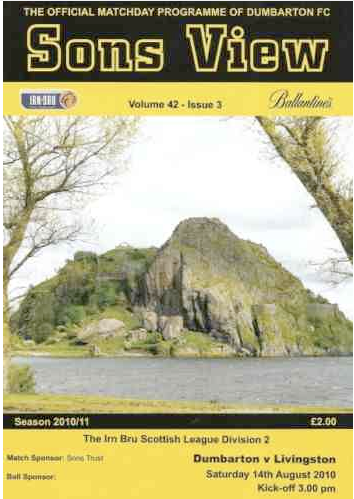 Here at Dumbarton we are not without our dramas, past, present and (no doubt) future. None of these quite matches the highs and lows of the cinematic Brian Clough. But they matter to us. And if there’s one clear lesson from the film – and from football over the years – it’s that when a club is divided, it falls. This afternoon everyone connected with Dumbarton FC will be as one in urging the team towards another solid performance and, we hope, a good result against Stirling. That’s the kind of spirit we need not just for one match, but for the rest of the season. So it’s ten games, ten goals and ten points for the Grecians so far. There’s a certain mathematical symmetry to the initial stage of Exeter City’s experimental first season in League One, but also an indication of the huge amount of work still to be done – since we nestle just two places and one point off the relegation zone. Over the past few weeks some BBC reporters and summarisers have taken to referring to City as “struggling Exeter”. That’s not a fair judgement of actual performances on the pitch, where there has often been an elegance and thoughtfulness on display – as you would perhaps expect from a team managed by Paul Tisdale. Looking back to my notebook from the beginning of the new adventure, I had reckoned that 14 points would be reasonably healthy at this stage. And with a few kicks and prods in different places, that’s just what City could be looking at. Putting this in perspective, there’s now only five points separating Huddersfield (our next away opponents) in sixth place and the Grecians a full thirteen places below them. That’s how tight it is. If Exeter had sneaked one more win and a draw we’d be ninth, in front of fancied Norwich. So in reality, a couple of games can make a huge difference in the run-up to Christmas. But that is certainly no cause for complacency. Points in the bag are the only ones that count, and the truth is that City have achieved only one clean sheet so far this term, and have been conceded far too many goals from set-plays, especially corners. At the other end of the field, even when the formation has been 4-4-2, Exeter have often been caught with one up front, with the inspired young Craig Noone drifting to the wing, with forward midfielders fractionally off the pace, and with no one really ready to threaten central defenders from the air. Classy build-ups often seem to go begging for want of something more decisive. That’s how it looks from where I sit, anyway. On Tuesday night all of those problems seemed to creep into an intriguing match against Swindon Town which we could easily have lost – or won, frankly – but which ended up with the honours shared (probably a fair result, all told) after some fine saves from Oscar Jansson and a bit of wizardry from Richard Logan. Logie most definitely doesn’t want to be thought of as a ‘super-sub’, and it will be interesting to see how soon he breaks into the starting line-up again. But no one could fault the daring involved in pulling Troy Archibald-Henville off and using him to throw the team into attacking gear. It was a calculated gamble that paid off with a niftily taken goal at exactly the right moment – when all might have been lost. So after ten games the Grecians have shown us plenty of flair and determination. But at the same time the backroom staff will undoubtedly be trying to iron out those little weaknesses and lapses that can make all the difference at this level of the game. Maybe City sometimes need to mix their naturally attractive football with the odd burst of ‘route one’, too. Swindon’s several (surprisingly) missed chances came from sudden bursts of energy around the area. Knowing how to inject pace and adrenalin into the match is vital. There’s still a little way to go to the next transfer window, which will focus our minds further on what is and what isn’t working as the season heads for its midpoint. Several of our strongest performers of late have come from loan deals, for example. But it’s also clear that a few regulars have more to offer, too. City have what it takes to stay in this League, but it’s a question of constantly refining the blend for each game – while ensuring that the backbone of the side remains constant. Who’d be a coach, eh? It’s easy to pontificate from the terraces, but it’s what happens on the training ground and in the dressing room that really counts. Meanwhile, Exeter now have a chance to improve their games-to-points-and-goals ratio this afternoon against Hartlepool, who sit seven places (but only two points) above us. The warning is that ’Pool have scored more and conceded half as many goals on the road as City – a trend which needs challenging on the park today. Despite their curious nickname, they’ll be no monkeys!